Vito Drago is an Italian-born artist who studied firstly in Milan and then at Central St Martin's School of Art, London. Exhibitions with England & Co include the group exhibition Literary Constructs (2006) and The Map Is not the Territory Revisited (2009). His book-works were included in Contained Thoughts at the Courtauld Institute Library Exhibition Space (2009), the same year that he had a solo exhibition, Quesito indagine espediente, in the Castello Beccadelli di Marineo in his hometown of Palermo, Sicily. 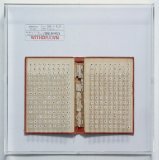 Drago has worked in a variety of media and his works reflect his interest in the materiality of books and documents. A series of photographic light-box works – his Vanitas series – allude to what he describes as "the ultimate futility of attempts to control appearance", by imposing pierced outlines of schematic clothing designs on to medical x-ray film sheets.